Jessica Leigh Clark-Bojin’s expert dough designs have earned her a following. A couple of years ago, the Vancouver-based filmmaker Jessica Leigh Clark-Bojin was struggling to find funding for her next project. And so it happened that a potential investor was the one who first suggested Clark-Bojin might try doing more with her other passion: piecraft. As she tells it, her interest in elaborately decorated pies began almost on a whim. One day, Clark-Bojin made an apple pie decorated with a fire-breathing dragon. Then she started an Instagram account to document her pie adventures. The account was a hit, and suddenly, she was a pie star. Today, her almost impossibly detailed creations have become an internet sensation. Since raising $32,146 in 2016 through Kickstarter for her geeked-out “pie guides” (plastic stencils that help people shape pie dough), Clark-Bojin has been able to devote herself to pie full-time. She’s created everything from a Nightmare Before Christmas-inspired tower to edible Disney princesses to photorealistic “pietraits” of Oprah Winfrey, Thor, and Lando Calrissian. Her work has garnered her an impressive following on Instagram [@thepieous] and she’s since published her own guide to “pie-modding.” She’s been featured everywhere from the Food Network to Buzzfeed to CNN. Not bad for a geek with a penchant for pie. We caught up with Clark-Bojin while she was busy working on a mini-theater-set pie to find out what it takes to be a pie artist, what pies she’d most like to make next, and what her beautiful creations actually taste like. 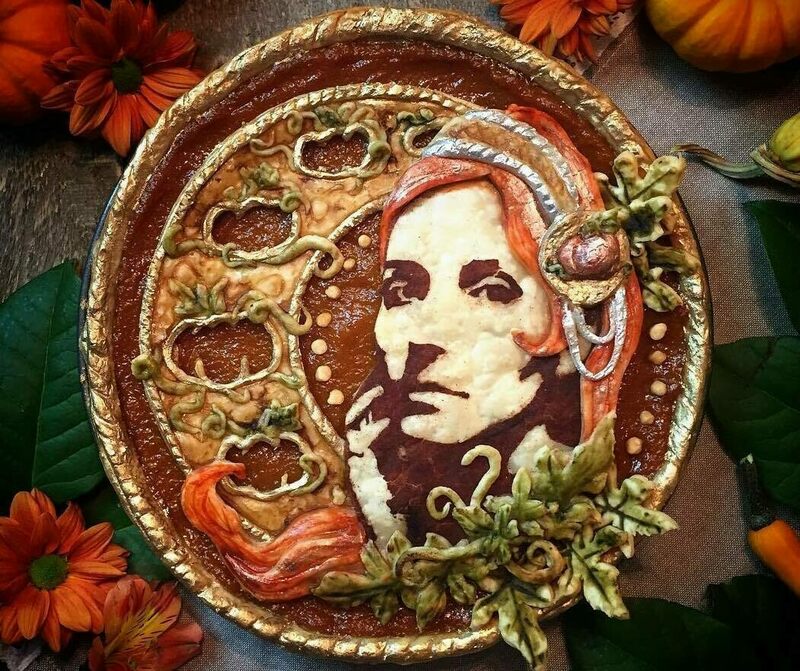 How did you get into making pie art? That was a bit to do with my personality. Whenever I make anything, I tend to like to nerd it up. When I’m having people over for dinner, I’ll have a theme around it or dorky stuff like that. I figured, this stuff is already taking me a fair amount of time, so while I’m here, I may as well cut this crust into the shape of a dragon. What was the first pie you ever made? The first pie I ever made in my life was a dragon pie that was breathing apple roses that were supposed to look like fire. I think it did. When I decided in 2016 to not eat sugar for a year, it was the only dessert I could think of that didn’t need sugar to be good. It was sheer desperation that got me to make my first pie. Why not cake? Why not… scones? The reason I stuck with it, for that first year it was out of necessity, because it was something I could eat. I made them interesting to amuse myself, but as I posted pictures and videos online, I was increasingly surprised that people hadn’t seen anything like them before. Did you have experience making decorative food prior to making pies? If you talk to my mom, she’ll tell you that I have always made very pretty food, and never paid enough attention to how much food I was making or what the ingredients were. When we were kids, my mom was going to college, so me and my brother each had a day of the week when we were supposed to cook dinner for the family. I would not call myself an expert cook or baker by any stretch of the imagination. It’s only in the past two years that I made a concerted effort to learn. When I was a teenager and it was my turn to cook, I would basically go by color palette. So I would cook a stir fry with any ingredient that would create a gradient on the plate. Even if it was fruits and vegetables and meat all mixed together. It was very pretty, but not all that edible. Has that gotten any better? Oh yes. Over the past years I’ve actually made a concerted effort to understand the chemistry and flavor profiles and things like that. I have some friends in the restaurant industry in Vancouver, and they’ve been instrumental in helping me understand what types of flavors go together, and what enhances the flavors of a dish and what works against it. Another friend of mine gave me a molecular gastronomy kit for Christmas two years ago, and that was another sort of catalyst because I got to appreciate food chemistry. I was never particularly interested in the kitchen before, but I am interested in chemistry. They said, ‘just think of it like a chemistry experiment.’ I started getting really into it, and now I make things that are definitely edible. I’ve got reams and reams of notebook pages filled with techniques I want to try and different flavor combinations I want to try, and different subject matter. But when it comes down to it, I tend to oscillate between huge bursts of creative energy and [becoming bored with a project]. How does the creation process go? It’s usually subject matter first, and then I figure out ingredients that will complement the composition. There are a couple of sketches that I have that are geometric or tessellation patterns, [where it’s the other way around]. That’s where I think, ‘what types of foods can I carve with a high degree of fidelity?’ So if I was going to do Escher’s lizards, I might do that with dragonfruit and kiwis because they won’t shrink as much, as opposed to say, bananas or apples, where the clock is ticking as soon as you cut them. How do you make your pies so photorealistic? Most of the things I do in pie, I create templates for, because you have to work fast. Even though I went to art school for four years and I can paint, I can’t paint in 15 minutes. I draw everything on the computer first, and I create templates out of card stock and acetate. I use acetate for stencils when it’s something that will be extremely detailed. You need a lot of patience. Some people don’t realize that creating stencils is complex. You can’t just push a button in Photoshop and now it’s a stencil, because you can’t have any islands. If you’re stenciling the letter ‘A,’ you can’t have the middle disconnected from everything. And when you’re dealing with faces it’s actually really complicated. You have to modify it so it still looks like the person, but so that it actually works as a stencil. I spend more time making the template than I do working with the dough. Who eats them when they are finished? Usually I make the pies really late at night. So the first slice is usually breakfast. There’s a reason I keep making apple and cherry pies all the time. Because I like them. What other designs are on your wishlist? I get a lot of requests from people and I try to honor requests whenever I can, and I have a lot that I’d like to do on my own. I have a lot of people asking, ‘when’re you doing Harry Potter?’ or Marvel or DC. But my own personal wishlist includes [Firefly], and also Doctor Who. I have so many drawings of TARDIS pies and stuff, and I just haven’t got around to it yet. I know I’m going to get flak for making the new Doctor, but I’m going to do it anyway. What would be the first step if someone else wanted to get into high art pie baking? I would say, spend a lot of time experimenting with dough. Go to the store, and bake up a bunch of batches of dough, and keep them in your freezer, and whip them out when you want to experiment. Just experiment with all the different things you can do with it. How can you paint on it? How can you blend layers together? How can you get it to stand? How can you drape it over forms? Just make a big mess with pie dough. Once you have a sense of what the medium is capable of, you can begin to apply your specific ideas and you’ll have a better chance of getting it to do the things you want it to do. Do you want to branch out into other baked goods? I think there’s more work to do in the pie realm yet. But I have plans for where I could take this next. I didn’t want to say it. It’ll sound better coming from you.